Yolanda Sandoval is a modern woman. As a first-generation Mexican-American, Yolanda grew up in El Paso, Texas, a border town in between Texas and Mexico, where she has since made a name for herself in pharmaceutical sales. 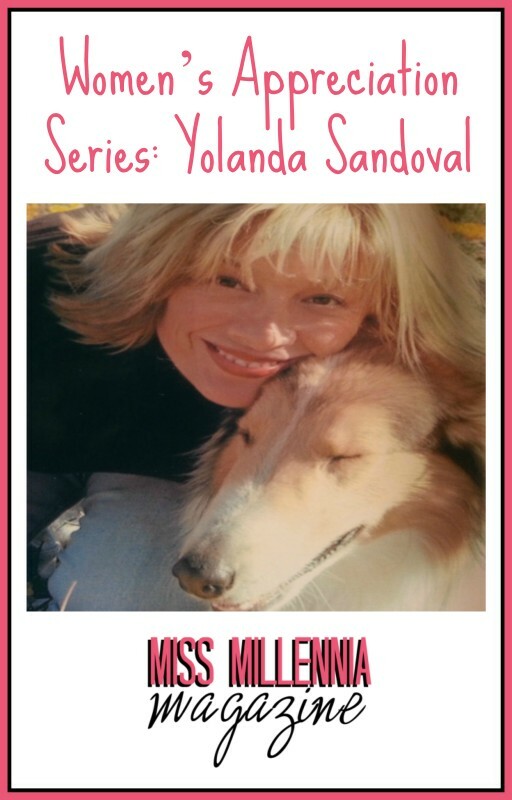 Like every woman in a primarily male-dominated industry, Yolanda has faced her share of challenges and has come out on top, becoming one of the number one contenders in her field. However, in spite of her busy schedule, she took some time out of her day to speak with us at Miss Millennia Magazine about how she handles herself and her thriving career. Miss Millennia Magazine (MMM): Alright, let’s start this off with you telling me a little bit about yourself and what you do. Yolanda Sandoval (YS): My name is Yolanda Sandoval. I am a Pediatrics/Women’s Health Pharmaceutical Representative. I sell prescribed medications for children and women, like cough/cold, sinusitis/allergies, anti-depressant [and] pre-natal vitamins. I am responsible for the West Texas Territory and am responsible for working pediatricians, OB/GYNS, psychiatrists and internists. I have worked in the industry for 16 years and taught for 15 years prior to that. YS: I graduated from high school in three years, earned my BS in three years, my MA in one year and began my doctorate by the time I was 26 years’ old (didn’t complete, though). 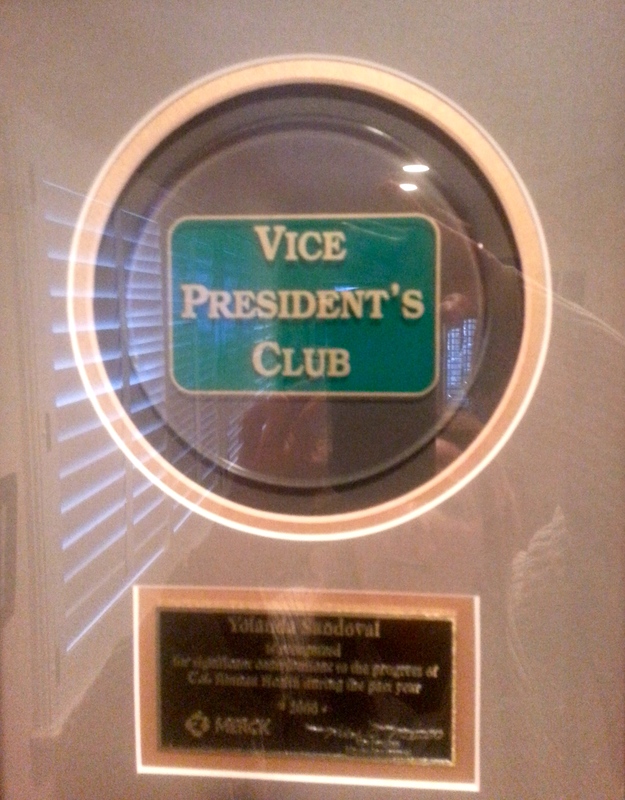 One of Yolanda’s many awards in her career in pharmaceuticals. MMM: In a field where you work with a lot of male presence in the form of doctors, what do you feel is your advantage? YS: My work ethic and professional follow-through with each of my customers has always kept me at the top my field. I study my products closely and learn the advantages/disadvantages of my competitors’ products. MMM: How do you want your work as a pharmaceutical representative to affect others? YS: I have always felt that it is a great responsibility to be a pharmaceutical representative because I am responsible for bringing prescription information to providers and medical personnel that will affect the way they diagnose and treat patients. In this field, it is easy to highlight the benefits of medications and to leave out the disadvantages they may have. However, it is important to provide fair balance in my sales presentations and to identify appropriate patients for whom my products are best prescribed for. MMM: Does anything scare you about the industry you’re in? YS: Yes, the healthcare act, medical costs and generics have impacted this industry tremendously. The pharmaceutical industry has been downsized by over 75% and there does not seem to be an improvement for the future. Medications are expensive to bring to market, and with FDA regulations, health insurance denials and cut [downs on] medical costs, many insurance companies are not covering brand-name medications anymore; they cover mostly generics. YS: I have always believed that nothing is impossible and that it’s not how many times you fall in life, but how many times you get up that will make a difference in my life. I was a non-English-speaking, overweight, friendless, scared child who was bullied by others when I first came to this country, and I am now an educated, well-adjusted, independent, strong, confident, successful woman. I believe that life is too short to cry over spilled milk! I am responsible and accountable for my happiness, success, health and wealth. YS: I am very fortunate to [have] be[en] surrounded by incredible role models throughout my life. The first is my mother, who overcame and continues to overcome the most difficult odds in her life and who, at 75-years-old has just attained one of her most incredible successes — purchasing her first house in another city and relocating at 75 years of age! She has just veered her life and happiness into a new direction! The second is my youngest sister, through whom I learned to set and attain higher goals for myself; to not limit my dreams. I am continually awed by her intelligence, wisdom and strength. YS: As a younger woman, my career goal was to own my own school for disabled children. I began to volunteer at handicap centers and at special education classes because I wanted to help those children have more quality in their life. As a result, I graduated from high school in three years, earned my BS in three years, my MA in one year and began my doctorate by the time I was 26 years’ old (didn’t complete, though). I began my first teaching job at 20 years of age and led over 1,000 students in a job training program that was community-based. I helped students achieve more independence, expand their surroundings and explore their community in ways that were more age-appropriate and fun at the same time. My passion and career as a pharmaceutical representative also comes from knowing that my products may help others have better quality of life by feeling better. YS: Start in pharmaceutical sales earlier! It is a very flexible, invigorating and ever-changing career, but most of all, you are constantly learning and have a lot of opportunity for professional growth and earning a great income. YS: I am a Mexican/American who came to this country as a non-english speaker with a lot of hopes and aspirations. My parents always taught my brother, sisters and I that in this country everything is possible with work and sacrifice. I believe we exemplify this success. We have all studied, held a strong work ethic and succeeded professionally beyond our dreams. We are a first-generation family in the US and believe that we have opened the doors for our niece and nephew to surpass us in their career and personal life goals.